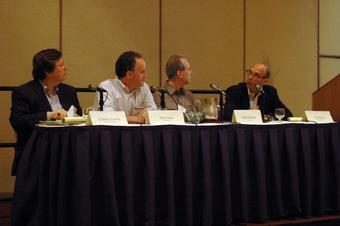 Restoring Journalism Trust: Is It Too Late? Cole Campbell and Donica Mensing at the University of Nevada-Reno are busy assembling the final report from our Wake Up Call conference and other parts of the Journalism and the Public: Restoring the Trust Year. During that week we will post the final report, the complete conference transcripts, photos and two videos from the event. In the meantime be sure to take a look at the continuing list of Restoring the Trust IM Interviews. The impetus for the Journalism and the Public: Restoring the Trust project, of which this conference is a part, was the CBS/Dan Rather firestorm of criticism and the September, 2004, Gallup Poll which reported, �the news media�s credibility has declined significantly, with just 44 percent of Americans expressing confidence in the media�s ability to report news stories accurately and fairly,� representing a 10 percent drop from year before and the worst level in 30 years. The Gallup Poll re-enforced the �State of the Media 2004� report, published by the Project for Excellence in Journalism, which stated, �Public attitudes about the press have been declining for nearly 20 years. Americans think journalists are sloppier, less professional, less moral, less caring, more biased, less honest about their mistakes and generally more harmful to democracy than they did in the 1980s.� It continues, however: �Journalists believe they are working in the public interest and are trying to be fair and independent in that cause. This is their sense of professionalism.� There was and is an apparent disconnect here. In this project we want to help determine why the disconnect exists and to help journalists at least consider it�and if necessary, to begin to make changes. However, even in the best of conditions, change is a slow process and it will not begin by itself. It needs catalysts for action and this project is designed to be one of those catalysts. With proper presentation, we believe journalists and journalism teachers can see which changes would be beneficial to them, their profession, and the general public. �Is the mainstream media in a death spiral? �Can improving editorial quality and trust save it? �If not, where will we be able to turn to find high quality and trustworthy news and information? �Is the salvation in citizen, community, and niche journalism? �What does all this mean to individual journalists, journalism educators and the public? I would argue the help is there, really it's everywhere, if the journalists are willing to accept it. It is in the form of the audiences themselves. It�s presenting itself in the form of weblogs, video logs, and podcasts. None of which are going away. In fewer than 4,000 days, we have encoded half a trillion versions of our collective story and put them in front of 1 billion people, or one-sixth of the world's population. That remarkable achievement was not in anyone's 10-year plan. � Today, at any Net terminal, you can get: an amazing variety of music and video, an evolving encyclopedia, weather forecasts, help wanted ads, satellite images of anyplace on Earth, up-to-the-minute news from around the globe, tax forms, TV guides, road maps with driving directions, real-time stock quotes, telephone numbers, real estate listings with virtual walk-throughs, pictures of just about anything, sports scores, places to buy almost anything, records of political contributions, library catalogs, appliance manuals, live traffic reports, archives to major newspapers - all wrapped up in an interactive index that really works. What we all failed to see was how much of this new world would be manufactured by users, not corporate interests�. This bottom-up takeover was not in anyone's 10-year vision. Why, I ask, would we as journalists, journalism professors and members of the news media in general turn our back on this public power? This bigger brain, that Kelly persuasively argues, will, by the year 2015, help us do so much of our thinking that if users are cut from it, it will feel as if they have had lobotomies. Why don�t more journalists accept what is happening? Part of the reason is attitude. Newsrooms, a Readership Institute study tells us, operate largely in an aggressive/defensive mode. Not a great formula for welcoming change. They are grounded in tradition and big institutions simply don�t change easily. 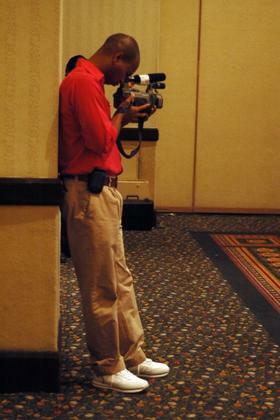 Years of public journalism experience have told us that most journalists don�t relate well to the public. We have closed the registration for the Wake Up Call: Can Trust and Quality Save Journalism? 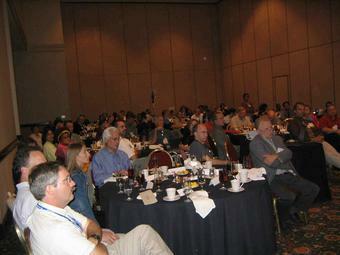 conference on August 9, 2005 in San Antonio. We were guessing that we would have 60 to 80 people in the room, but now it looks like we are at 105. You can see the registered list as of July 22 here. We have a great line-up of speakers and a great program. So we should not be surprised at the response from people who want to attend. Of course, we are right in the middle of great speculation of what will become of the news media as we know it. And the discussion is playing itself out almost daily in the places like The New York Times and National Public Radio. Our conference rooms on August 9 will be wireless and we are hoping for some blogging and podcasting. In fact, MySanAntonio.com, which is run by the San Antonio Express-News and KENS5 will be promoting the conference blogs on its website. Later the folks at the Reynolds School of Journalism at the University of Nevada, Reno will be writing a special report. So even if you got shut out of the main event, you can be in touch via the internet. If you are already signed up, be sure to bring your laptop and start blogging or podcasting. m7music.com a local hip hop podcast will be demonstarting how to podcast--and we hope helping the folks at the conference to do some podcasting. And if I get some time, I might even try to do a little vlog. Stay tuned. Last week I was busy exchanging emails with Craig Newmark, founder of Craigslist, asking him to be a speaker at our A Wake Up Call: Can Trust and Quality Save Journalism? 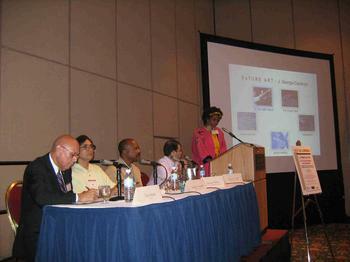 conference on August 9 in San Antonio. He has accepted the invitation. Even though, many of America's news editors might not realize it, this is big news. At least it is for people interested in the future of journalism. This conference is occurring in a special time in media history, and citizens, journalists, and academics need to hear from people like you who will be deciding what the future of the media will be, and perhaps what our democracy will be like. It is very important stuff. One of the most telling moments of the hour occurred just as the meeting opened when Nachison and Peskin put a slide up of Craig Newmark and asked how many people in the room of several hundred recognized him or his name. Only a smattering of hands rose. A few more hands went up at the mention of Craigslist and its free classifieds. Nachison reminded the editors that the competition of Craigslist didn�t grow out of a business model, but arose more spontaneously from Newmark�s desire to create a community of trust � the same trust newspapers are struggling to regain. The message here: In today�s media world the audience � and their money � follows trust and credibility, characteristics that evolve from authenticity, transparency and voice, rarities in our newspapers. So my advice to news editors is for $49 get enlightened on August 9, your paper's, you own and our future might depend on that enlightenment. 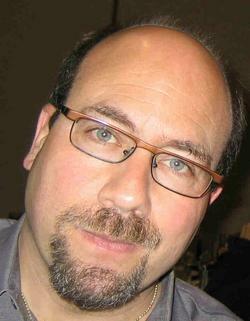 Newmark is intently interested in advancing the citizen journalism movement. Although his plans are still sketchy, he'll likely start with a personal financial investment. But his interest may eventually come to involve craigslist itself. Then just as I was writing this Porter was giving us more information on Newmark and his possible future commitment to citizen journalism. Listen up editors, this is IMPORTANT. George Cisneros, one of the panelist at the Wake Up Call conference on Aug. 9, is rushing a deadline in San Antonio "to get free or low-cost Internet access to some of the city's poorer residents," according to a San Antonio Express article written in early April. Cisneros told the Express: "This is going to open up San Antonio's under-served communities to the rest of the world." ...a bill in the Texas Legislature aims to put restrictions on city-sponsored free Wi-Fi access. House Bill 789, which passed in the House of Representatives earlier this week, is one of 11 bills around the country backed by big telecommunications and cable companies that prohibit cities from providing blanketed free Wi-Fi access. If Cisneros can get the Wi-Fi up before June 15, the law would not affect his effort. Scarcely a day goes by without some claim that new technologies are fast writing newsprint�s obituary. Yet, as an industry, most of us have been remarkably, unaccountably complacent. There are a number of reasons for our inertness in the face of this advance. First, for centuries, newspapers as a medium enjoyed a virtual information monopoly � roughly from the birth of the printing press to the rise of radio. We never had a reason to second-guess what we were doing. Second, even after the advent of television, a slow but steady decline in readership was masked by population growth that kept circulations reasonably intact. Third, even after absolute circulations started to decline in the 1990s, profitability did not. The Journalism and the Public: Restoring the Trust website is now up and running. This is part of a one year project that Cole Campbell, dean of the Reynolds School of Journalism at the University of Nevada, Reno and I are hosting in conjunction with the Public Journalism Network (PJNet.org) and Civic Journalism Interest Group in the Association for Education in Journalism and Mass Communication (AEJMC). It is underwritten in part by the Ethics and Excellence in Journalism Foundation. As you will see by roaming about this website, the big event will be the conference entitled: A Wake Up Call: Can Trust and Quality Save Journalism? The conference will be in San Antonio, August 9 to help open the AEJMC annual convention activities. Also I will continue doing more IM Restoring the Trust Interviews. I sent out a few more invites today. Know someone who is doing interesting work in this area, contact me. Any how, take a look around. Got any suggestions, or find any glitches let me know. And of course start making plans for the conference now. In fact, register now and be done with it. You won't want to get shut out. Much of the work here is supported by the Fowler Chair in Communication, which I hold, at Kennesaw State University. Special thanks to Cori Marguriet, Griff Wigley and Chris Ward for all the hard work they put into making this website possile.